Brecon Jazz Festival » STEVE WATERMAN to Direct the Festival Big Band 2019! Festival Big Band on Friday 9th August at the Brecon Jazz Festival – and in the splendid Castle Hotel ballroom!..I’ve been working alongside the organisers Lynne & Roger to handpick an amazing group of musicians, and I’ll be bringing a selection of jazz arrangements and compositions (including my own) to showcase the talents of everyone involved”. 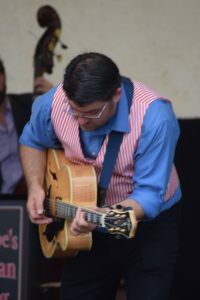 He adds that “it will certainly produce a performance that can only be heard at this year’s festival, on Friday at the Castle at Brecon Jazz 2019!”. 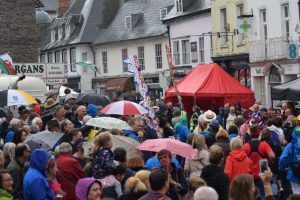 This year – which is Brecon Jazz Festival’s 36th year – we are planning to programme from THURSDAY (8th August) in order to include a major event which will also be promoted to the town and surrounding area – a jazz orchestral work. FRIDAY’s programme (9th August) will commence after lunchtime, from 2pm, with FREE JAZZ concerts and featuring young people, until around 4.30pm. This will be followed by another UK top name CHARITY concert at 6pm, and then our BIG BAND special at around 8-8.30pm (with meal beforehand) at the Castle Hotel. On each of Saturday and Sunday, we are planning major concerts. They will begin each weekend day at noon; the Festival will close on Sunday evening. Top UK, a number of European stars, and a leading US jazz name will be featured. More info via the B&R in the weeks to follow. TICKETS: there will be an inclusive ‘Weekender’ ticket, as well as Saturday and Sunday ’Day’ tickets, and all concerts will be able to be booked individually, subject to availability. Friends of Brecon Jazz get special discounts and the first ticket release, so check their website and join up in time to support the 36th year of Brecon Jazz Festival.